Just two blocks from the historic Cottonwood Hotel is this rare and unique greenway riparian habitat. This historical site is one of ONLY twenty of its kind in the world. This Fremont Cottonwood/Goodding Willow Riparian is also one of five remaining stands in Arizona. The one mile trail starts at the western edge of town behind the old jail. 1/2 mile into the trail, the Verde River Greenway accesses the Dead Horse Ranch State Park. 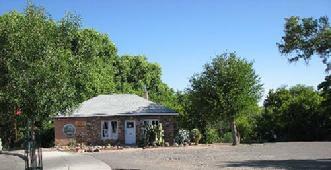 It is of a 6 mile reach of the Verde River Greenway, which is only part of the 180 mile long year round flowing river. The riparian is identified with its dense forest of riparian trees and shrubs along its banks and its many rare animals and plants that inhabit this uncommon habitat. River otters have long, slender, bodies and can weigh up to 20 pounds. Legs are short, but powerful with webbed feet. The short dense fur is dark brown. Chin and stomach are reddish yellow, tinged with gray. Females are a third smaller than males. 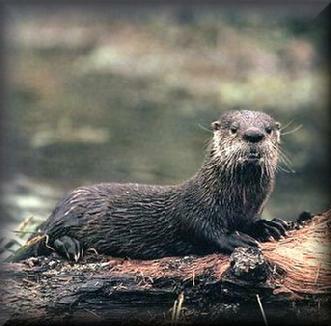 River otters prefer streams, rivers, lakes, estuaries, and salt and freshwater marshes. They eat fish, crayfish, frogs, turtles, and aquatic invertebrates, plus an occasional bird, rodent. Females bear one to two kits. The otter kits start their life in a burrow in a river bank, usually an abandoned muskrat den. Born blind and helpless, they are nursed by the female for about a month, then the mother begins to teach them to swim and hunt for food. Endangered Species: Comeback. Is now off the endangered list. The population of America�s symbolic bird had declined from half a million in colonial times to 417 in 1963. Today, the population has rebounded to more than 10,000. The bird�s comeback is attributed to protection provided under the Endangered Species Act as well as the banning of the pesticide DDT, which was damaging its eggshells. The bald eagle is a large raptor with a wingspread of about 7 feet. Adults have a dark brown body and wings, white head and tail, and a yellow beak. Juveniles are mostly brown with white mottling on the body, tail, and undersides of wings. Adult plumage usually is obtained by the 6th year. 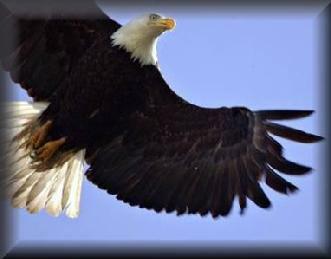 In flight, the bald eagle often soars or glides with the wings held at a right angle to the body. THE SOUTHWESTERN WILLOW FLYCATCHER (Empidonax traillii extimus) is a small passerine bird placed on the federal Endangered Species list in 1995. To learn more on out what the flycatcher looks and sounds like, and learn about the status, distribution, biology and habitats of this endangered bird CLICK HERE. The USGS Southwest Biological Center hopes providing access to such information will promote an understanding of its status and ecology, encourage further research and cooperation, and help promote effective conservation and management. The Southwestern Willow Flycatcher (Empidonax traillii) measures about 5.75 inches (15 cm) in length, and weighs only about 0.4 ounces (12 g). Overall, it is roughly the size of a small sparrow. Both sexes look alike. 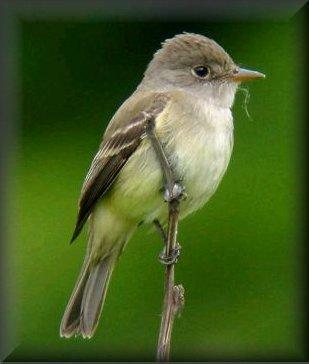 The flycatcher's appearance is overall greenish or brownish gray above, with a white throat that contrasts with a pale olive breast. The belly is pale yellow. Two white wing bars are visible, but the eye ring is faint or absent. The upper mandible is dark, and the lower mandible light. 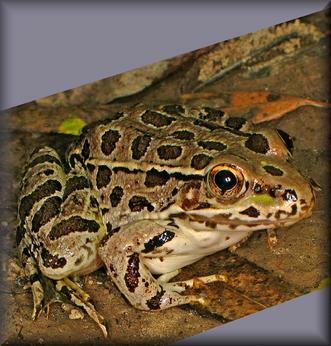 The lowland leopard frog is a state candidate for threatened species in Arizona and is a U.S. Fish and Wildlife Service Species of Concern. It appears on the Forest Service Sensitive Species List. Habitat: This species is generally restricted to permanent waters below elevations of 3,000 feet. It is found in small to medium streams, and occurs in small springs, stock ponds, and occasionally in large rivers. Populations typically occur in aquatic systems with surrounding desert scrub, semidesert grassland, or evergreen woodland. Reproduction: R. yavapaiensis breeds February through April, and depending on conditions, sometimes in the fall. Eggs hatch in 3 to 18 days. The tadpoles emerge from winter spring eggs, transforming to frogs from June to August. Males lack vocal sacs to create a chorus while looking for a mate. The lowland leopard frog has brown to green skin with spots on its back, and yellow skin on the bottom. The legs are striped. Diet: Adults feed on small insects; tadpoles feed on algae, plant tissue, and small insects. Predators: Cougars, birds, predatory fish, and other frogs. The area also supports some of the highest breeding bird densities of any North American habitat of rare species. In addition, this area Greenway boosts numerous culturally significant sites from the nearby Tuzigoot National Monument and several yet to be excavated habitations.